Department presents proposals to monitor the performance of the Independent Communications Authority of SA council. 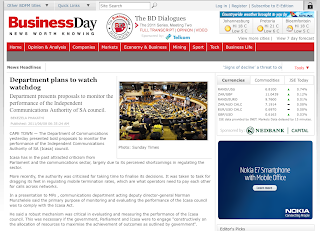 CAPE TOWN — The Department of Communications yesterday presented bold proposals to monitor the performance of the Independent Communications Authority of SA (Icasa) council. Icasa has in the past attracted criticism from Parliament and the communications sector, largely due to its perceived shortcomings in regulating the sector. More recently, the authority was criticised for taking time to finalise its decisions. It was taken to task for dragging its feet in regulating mobile termination rates, which are what operators need to pay each other for calls across networks. In a presentation to MPs , communications department acting deputy director-general Norman Munzhelele said the primary purpose of monitoring and evaluating the performance of the Icasa council was to comply with the Icasa Act. He said a robust mechanism was critical in evaluating and measuring the performance of the Icasa council. This was necessary if the government, Parliament and Icasa were to engage "constructively on the allocation of resources to maximise the achievement of outcomes as outlined by government". Mr Munzhelele said some of the salient points about the performance management system would take into account issues of compliance and time frames. He said the management system would be linked to the authority’s financial year. "As soon as the National Assembly approves the PMS (performance management system), individual performance agreements must be signed between the minister (of communications) and all the councillors," Mr Munzhelele said. Icasa chairman Stephen Mncube said the Icasa council would "try and honour the objectives (of the proposal ) religiously". He said one of the biggest challenges facing the regulator was its failure to undertake impact studies because of budgetary constraints. Communications portfolio committee chairman Sikhumbuzo Kholwane said MPs were satisfied with the proposed changes. "I am sure we will soon be handing the document over to the minister (of communications) who will then hand it over to the speaker’s office," he said. Democratic Alliance MP Natasha Michael said it "would be fantastic if Icasa implemented the performance management system". "I see no reason why (the system) should not go through. "It would force departments to be more accountable," Ms Michael said. Aquavision is Looking for Producers!